In chapter two of the continuing saga of my backyard grilling session with Jamie Purviance, I learned the tricks and subtleties of making a rotisserie chicken. The reason I insisted Jamie divulge all of his poultry pointers is that The One and I have been devouring rotisserie chickens (AKA RoChix) from Citarella in New York, two blocks from our apartment, for years. They’re so tender and packed with flavor, we knew we had to figure out how to cook them—even better. After we seared the brine recipe into our brains, we began knocking these suckers out of the oven left and right. But we realized a lot of chicken-y goodness was being left in the pan. (We took a page from Ina Garten’s book—literally—and tossed homemake croutons with the pan drippings to great affect and copious rounds of applause.) But still that didn’t solve our dilemma: The more fat and juices that dripped off the chicken into the pan, the less juicy and flavorful the bird. Plain old physics, right? Weber Summit S-670, I made sure it was kitted out with a rotisserie. On the appointed day, with rotisserie saber in hand and forks at the ready, Jamie showed me how to truss the chicken, slide it onto the saber, secure it with the forks, and let it rip. Because it’s a horizontal rotisserie, it bastes the bird in a continual bath of goodness from stem to stern as it rotates. After about two hours in the Weber “sauna of flavor,” theRoChix was evenly cooked, bursting with juices, and had crispy, beautifully browned skin. And this was no one-off. Since Jamie’s visit, The One and I have made RoChix again and again and again—to even greater applause. (Flowers have yet to be thrown at my feet, though.) While the bird is resting on the cutting board, all that’s needed is to pop an excellent bottle of wine, grill some veg-edibles, drag the table into the middle of the backyard, and dinner is served. P.S. All right, I’ll admit it, I’m showing off a bit here. (But you would, too, if you had a rotisserie worthy of the gods.) I can assure you don’t need one to make fabulous grilled chicken. Try Bacon-Wrapped Chicken Wings, Grilled Chicken and Red Onion Quesadillas, Grilled-Roasted Chicken. But do yourself a favor and brine it first. It makes a whopping difference. David, for the love of all that’s holy, could we pleeeeeeeease have the brine recipe??? To me brining is the essential thing to do, but lately I have been using a recipe from MS Living(!) that is a great thing with chicken, whole or parts—buttermilk with salt, garlic and LOTS of chopped thyme. Brine the bird for about 8 hours, wipe dry and rotisserie or grill. As a fan of crispy, lucious skin, you don’t get it but the trade-off is worth it for the quality of the meat (assuming a decent chicken to begin—not one of those poor, tormented confined creatures. Paseo, it’s interesting to know the recipe calls for buttermilk. I’ve used it many times for fried chicken, but never for brining. what is it all for the meat itself? Another wonderful production! Where is your brine for chicken recipe? I have been searching and experimenting forever to discover the perfect brining ingredients and times for chicken, and so far not very successfully. Pray tell! I kind of thought I gave the recipe in the post! You’re going to have to nudge The One, because it was he who really finessed the brine. Yes, PLEASSSSEEEEEEE give up the brine recipe! I have a Mother-In-Law to impress! Amanda, as I said to Susan, everyone’s going to have to nudge The One for the recipe. He owns it more than me! Ah, David, it’s a tough job, but someone has to do it. LOL! ‘Tis true, my dear Renee, ‘Tis true. Love the video. I have always stopped short of the grill myself, but this makes me want to get in the game. And, for the record, it’s not just Leite’s Culinaria fans who want the specific brining recipe. Staffers would love to have it, too, so… Pass the word on to The One: another please, and this one is pretty with sugar or cherries or whatever it is that he wants on top. Hey David, How about that brine recipe for us man? Also be honest, you can “nudge” it for us right? You can’t tease us like that! It’s just cruel. Jamie, that’s harsh, but it just might work! I adore a buttermilk-‘brined’ chicken. It’s my roast chix go-to. Dump the bird & the milk in a big zipbag & set it in the fridge for a day or two. Drain, pat dry & oven roast, or grill, as you like. If you spatchcock it before you put it in the bag, & lay it out nicely on the grill grates, it makes a dashing presentation at table, all from the simplest of beginnings. It’s just chemistry. Don’t forget the Kosher salt & freshly ground pepper. ps. @The One..nudge nudge, wink wink, say no more, ya know what I mean? Sounds a great recipe. I have to try it. And, yes, I’ve made The One aware that he has a social responsibility to supply his brine recipe. But the refrain I keep hearing is, “It changes a little bit every time!” But I have alerted him to the severity of this issue, and he promises to get back to everyone soon. For all who asked, here it is. Keep in mind that I like to do things quick and easy. So my “recipe” for brining is a loose and fast style. For example, many people put herbs in the brine and boil it. But quite frankly, I don’t bother, and no one knows the difference. Many chefs and in-the-know cooks might cringe and do it very differently. But for me, it works. 2. Add the garlic, peppercorns and herbs. Stir to combine. 3. Fill the pot about half way with cool water. Place the chicken in the pot and fill it with more cool water until the chicken is covered. Cover the pot and place it in the fridge for at least six hours, or, preferably, overnight. 4. Remove the chicken from the pot and pat it dry with a paper towel. Some say you should rinse it at this point. I don’t because I like the full flavor. 5. Stir the butter to make a paste. You could add chopped herbs to the butter, if you like. It’s always a nice touch. Gently lift the skin covering the breast and legs and rub the butter mixture into the meat. Also make sure to put some in the cavity of the bird. Truss the chicken and smear the remaining butter all over the bird. Sprinkle with the pepper. 5. Roast the chicken as you normally would or, if you have a rotisserie, follow the instructions in the video. Cut and enjoy! Yahoo! It would appear the clamoring masses will be appeased! thank you. Wow! Having just noticed that the brine recipe is posted, I have to say… The One is number one in my book. Can’t wait to try it out. Thanks so much. Well put! He is number one in my book, too. Thank you, The One. I will be grateful eternally, and especially when I eat the grilled chicken. 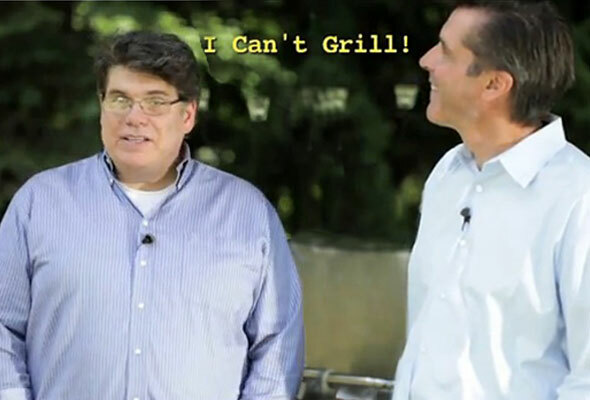 All three installments on grilling were great! Thanks to David, Jamie, and The One. Susan, it was our pleasure. We had a great time doing it. Keep an eye out in the Multimedia section of the homepage for future videos. Excellent! i can’t wait to try this out. Thank you for the recipe! Will be trying it this weekend for a group BBQ. Tried the brine out last weekend and it was a hit, the chicken was unbelievably juicy and tasty. Definitely will make this again! Thanks for sharing. We bought a new grill this summer and have rotisserie chicken every week – it is so delicious. We use a sugar-salt brine also. Please experiment with other meats on the rotisserie and share your findings! David, I just discovered your site after seeing the grilled steak video on Weber’s Facebook page. Thank you so much–with proper obeisance to Jamie and “The One”–for these excellent videos as well as all the other assistances your site provides. Hi there, thanks for sharing this post, as my family too LOVES rotisserie chickens, and I am endlessly trying to replicate the flavor that they crave. Have you posted the brine recipe? I would love to try it! Dianna, you’re more than welcome! I haven’t posted the brine yet. That sneaky The One is very evasive. I will try asking again.